Wish you had more customers? 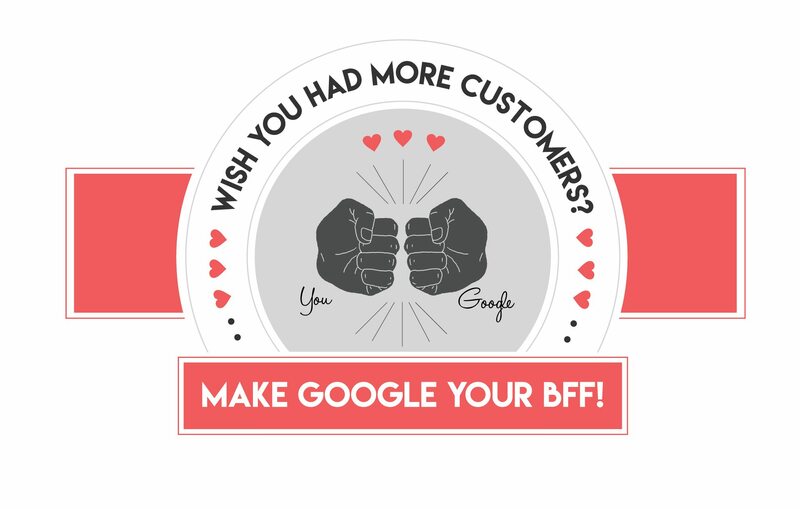 Make Google your BFF! It’s a common question that you as a business owner have probably asked yourself more than once. Just like the iconic/cliche high-school movie underdog, the popular girl in school (aka: your potential customers) may not even know you exist. So how do you get the popular girl to notice you? Why Make Google your BFF? Maybe you’re struggling with brand awareness and maybe you notice that your competition is blowing you out of the water in the customer acquisition game– and now you’re ready to fight back and stake your claim. You might not know what you’re doing wrong and are most likely stuck in a vicious cycle of using antiquated methods of marketing outreach that are costly, hard to track, and depressingly ineffective. You may have even dipped your toe in the world of PPC to test the waters. If your business has any kind of online presence, you’ve probably gotten your fair share of solicitor calls from “click-farms” in India promising you greater ranking on Google (bad idea). But what does that even mean… and why should you even care what your “ranking” is? Your Google ranking is what their algorithms deem your website’s relevancy rating for a certain search term is and where you should show up on search result pages. Google uses about 200 ranking factors – some are proven and well known, some are controversial amongst marketing professionals, and others are simply “SEO-nerds’ best educated-guess speculations”. If you don’t “prove your worth” to Google, your site isn’t shown in searches. …And that means if you don’t show up when and where a person needs you, you’ve lost that sale. If you do make it to the first page of Google here’s some tips on how to stay there. Bottom line: Google rankings can make or break a business. Just How Influential is Google, Anyways? “Do they have In n Out Burger in Florida yet?” Hold on lemme Google that. “What was that actress’ name that was in that movie with that Vampire? No, the other Vampire.” Just Google it! You get the picture. A whopping 97% of consumers get their first impression of a business from search engines— and Google has officially been crowned king with 70% of the search engine market share. This is just the tip of the proverbial iceberg. Check out this handy infographic on just how influential Google is on the visibility and success of a business. Like this infographic? Embed it using the code below! Looking for a more in-depth explanation of Search Engine Optimization? Check out our easy-to-understand guide to just what Search Engine Optimization is! Previous Post: « Multiverse Media Group Announces A Brand New Website Design!